This Flatford National Trust Summerhouse has been installed overlooking our customer’s garden in Peterborough, Cambridgeshire to use as a relaxation spot. The spacious summerhouse features windows all the way round to be able to enjoy the garden view whilst inside. Delivery and installation from our expert team was included. 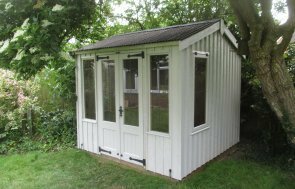 This particular Flatford Summerhouse is 2.4 x 2.4m in size, and has a pent roof with a slight overhang over the front side. This provides shelter and protection from wind and rain. The roof has been covered with durable corrugated material to make it even more weather resistant. 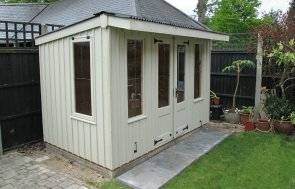 This also gives the summerhouse a traditional style, alongside the vertical sawn cladding, leaded Georgian windows and cast iron Fleur-de-Leys style door accessories. The colour of this Flatford is Earls Grey, a neutral, off-white colour from the National Trust paint range. We have a host of hand-crafted garden buildings available for you to choose from. Visit one of our UK Show Centres today to find your ideal garden building. Have you been inspired by this summerhouse? If so, and you'd like to continue browsing online, click the link below.